eProcure is Australia’s fastest growing e-Procurement solution. Offered as a stand-alone in-house option, or now available as a SaaS (Software as a Service), organisations can implement “Best Practice” Procurement across the board, in days rather than months. Our innovative technology provides organisations with a powerful and robust solution, which removes the huge administrative burden associated with producing and disseminating Bid, Tender and Procurement requests, the management and evaluation of submissions and the management of your supplier base. We are committed to ensuring that the eProcure platform remains “Best of Breed” in an ever changing procurement landscape. We have continually challenged the big end of town, with our innovative and very importantly “Cost effective” solution that challenges the Status Quo, by providing disruptive technology and a new way of thinking about procurement. Gone are the days of huge investments in old fashioned “Legacy Systems” that are a nightmare to use and cost a fortune to implement and maintain. SaaS (Software as a Service) delivery ensures you have a solution in days, not months and our commitment to a program of continuous improvement will ensure that your solution continues to deliver into the future. Why not get on board and see why our solution ticks all the boxes? An integral part of an efficient e-Procurement system is the Supplier interface. Designed with wide input from suppliers, our design reflects an integrated work flow approach, which provides your supplier base with an easy to use response interface to your requests for submissions. Ability to integrate with Nimblex Contract Management . The supplier “Front End” lists all your “Open” Rfx opportunities in a simple easy to read format. “Open” Opportunities are calls for submissions from the open market allowing potential suppliers to bid openly for your requirements. 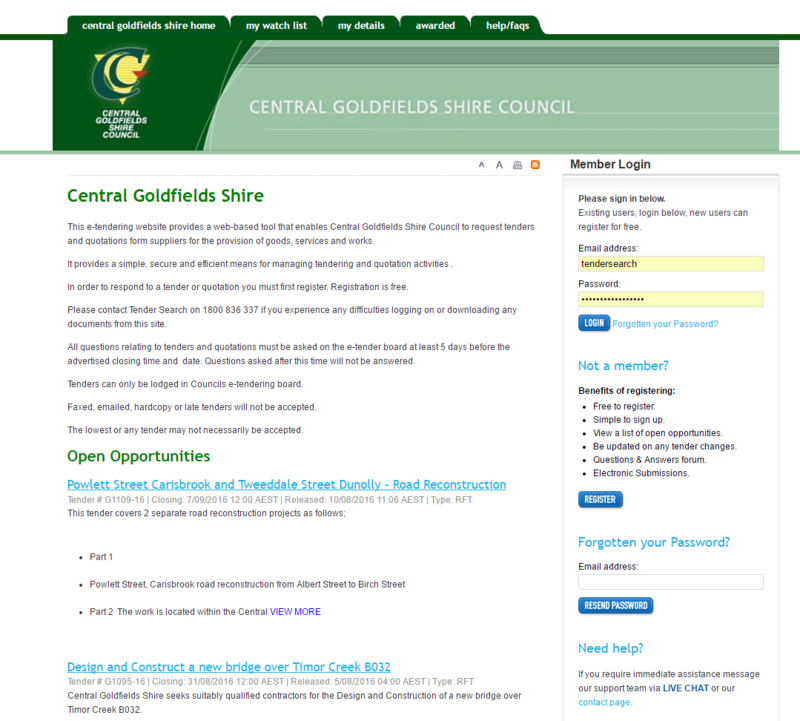 Central Goldfields were not new to utilising an e-Procurement Portal, having recognised the benefits that this technology can bring to Council a number of years ago. 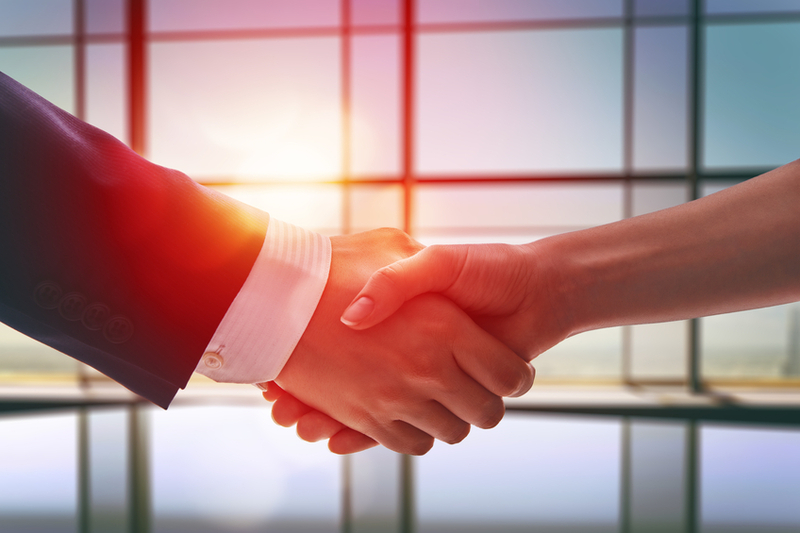 With the recent introduction of our Contract Management system, we took the opportunity to upgrade our e-Procurement Portal and chose the TenderSearch solution. We have found the Portal intuitive, easy to use and very powerful. The supplier interface matches more closely our Council Website and our suppliers have found the change seamless. The features are very comprehensive and we can see that they have been well designed and thought through, perhaps because of the continuous improvement processes at TenderSearch and the feedback sought from their existing Local Government clients. The reports provided via the Portal are easy to produce and access and the question and answer forum, with corresponding communication reports mean we are very comfortable in ensuring we meet our legislative obligations and keep our Auditors happy. The training given to us was thorough and the support, especially during initial implementation stage has been fantastic. The support team are helpful and courteous at all times, for both the support offered to our staff and the suppliers using the Portal. The TenderSearch solution meets all of our requirements and would not hesitate in recommending it to any Local Government organisation looking for a state of the art solution from a local supplier, that delivers very high standards of probity, security and accountability. Michelle PlainContract Manager– Horsham Rural City Council. Horsham City Council has been utilising the TenderSearch e-Procurement Portal for over two and a half years. It would not be an overstatement to say that it has revolutionised our procurement activities. The ability to quickly and securely call for Tenders, Quotes, expressions of interest etc. has greatly improved our productivity, whilst vastly improving our reach, to ensure Council receives the best possible value for money in our purchasing. The ability to call for open Tenders as well as invited quotations has speeded up our processes to market and at the same time the comprehensive audit trails automatically provided through our procurement processes have given our Auditors and senior management a high level of comfort. The free, easy, registration process has been well received by our contractor and supplier base and they have found that doing business via our Portal aids in streamlining their responses allowing many Small to Medium enterprises to vie for Council Business. It has saved me many hundreds of hours previously spent in managing the difficult process of not only ensuring fairness and equality of opportunity via our procurement, but in the comfort of knowing “Best Practice” Procurement is embedded in our culture at Horsham. The support from TenderSearch has been outstanding in terms of both the support given to me in the Management role and for the hundreds of suppliers and Contractors registered on our Portal. I would have no hesitation in recommending the TenderSearch solution to any organisation looking to improve Productivity, Probity and Governance in any sized organisation. 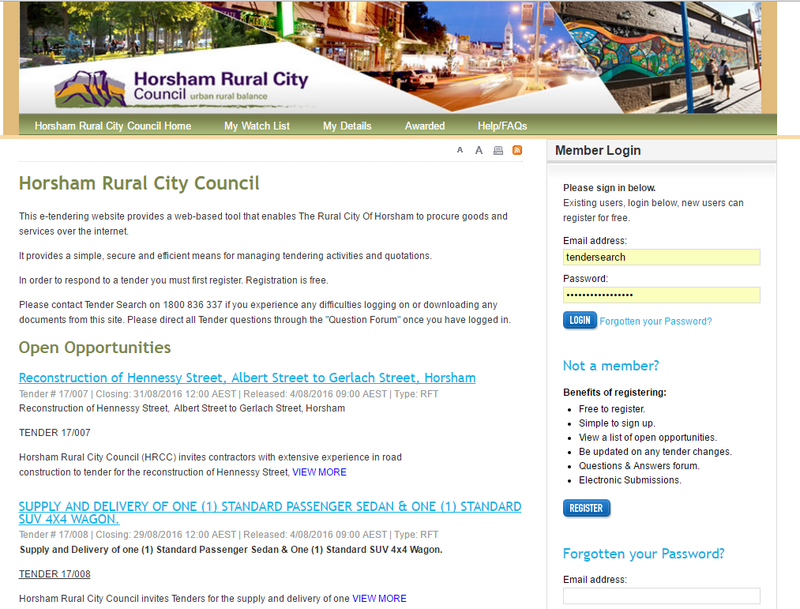 Contract Manager– Horsham Rural City Council. 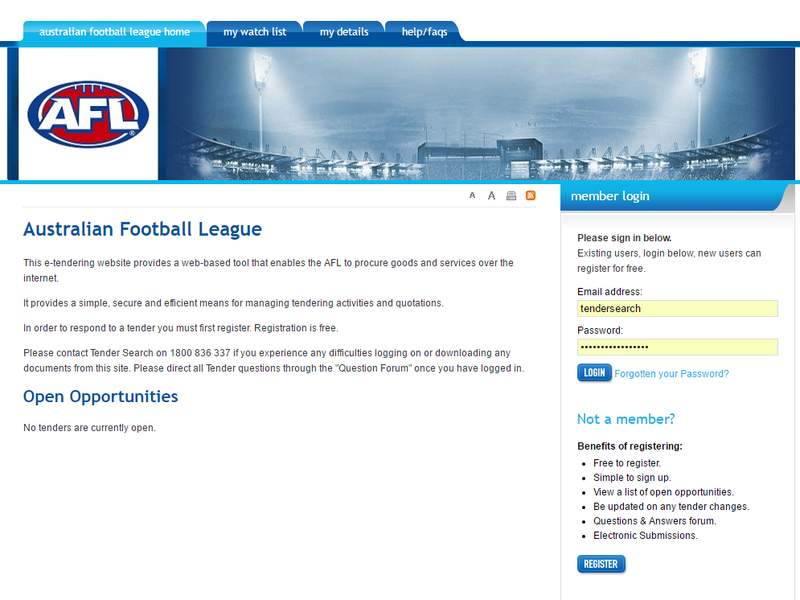 I have been using the TenderSearch e-Procurement Portal now for almost three years, both in my current capacity at the AFL and as the Procurement Manager for the Melbourne Cricket Club at the MCG. 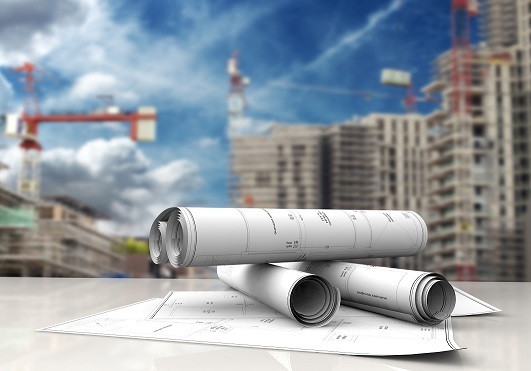 The ability to call for both open and private (invited) Tenders and quotes via our Portal, has had a huge impact in terms of the amount of time and effort required to successfully manage the demanding processes required. The Portal is easy to use, for both the administration staff and the contractors and suppliers quoting for the work. In utilising the Question and answer forum, contractors and suppliers can be sure of a prompt reply and the ability to post answers which are automatically forwarded to the registered suppliers save us time and ensures probity. The Audit trail provided by using the Portal is invaluable in ensuring that our Auditors can be satisfied that our procurement processes stand up to scrutiny. During my time in using the Portal, I have seen a genuine commitment from TenderSearch to seek feedback from us for improvements and with three upgrades in less than 12 months their continuous improvement efforts have been impressive. Their service, both in terms of their user support and the support for our many suppliers and contractors has been outstanding. The electronic tendering system is easy to use and is getting easier with the various modifications and updates that TenderSearch are making to the Portal. TenderSearch listens to the end users and makes improvements to cover off on their requirements where possible. Their after sales service is outstanding and cannot be faulted. This electronic tendering systems covers off on all of our Probity issues surrounding submission of tenders and quotes. The contractors have also stated that this is a good system because submitted prices for tenders and quotes cannot be opened until the appointed closing time and date, therefore they have confidence that their pricing has not been given to a competitor. Documentation is easy to distribute to contractors and when they have questions they ask these through TenderSearch and when we answer the question it is sent to every contractor and this keeps them all on a level playing field in relation to the specific job. Until TenderSearch approached Pacific Link some 2 years ago, we had not considered electronic tendering. Today, I would not look back and would recommend it to any organisation. One of the many advantages of this facility is the broad exposure to service providers which would not always be available through print media, cost effectiveness and documentation control. 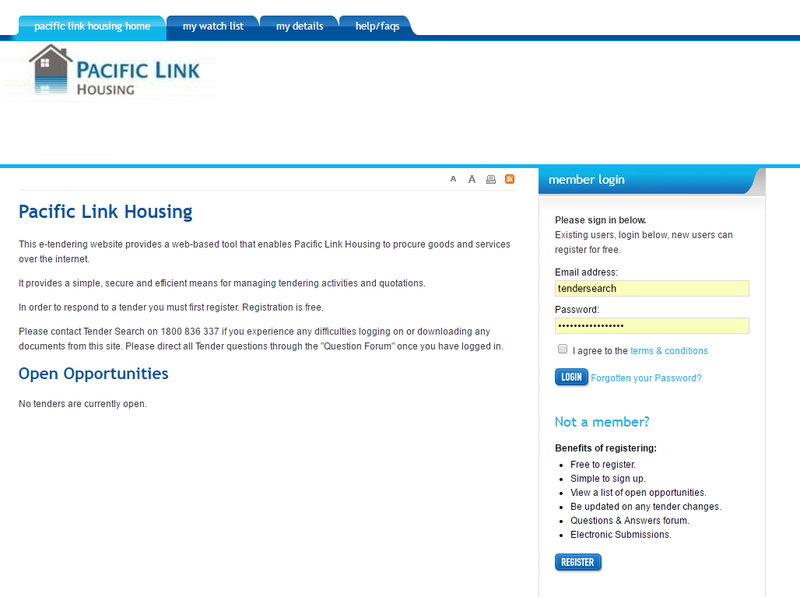 Since Pacific Link has been using TenderSearch we have used both the private and public invitations for a range of services. If the facility is used correctly by all users, everyone is kept informed, up-to-date, documentation is secured until the tender is closed. To cap it off the staff at TenderSearch are always helpful. Pacific Link has no hesitation in recommending TenderSearch as an electronic tendering provider to any organisation, regardless of your size. 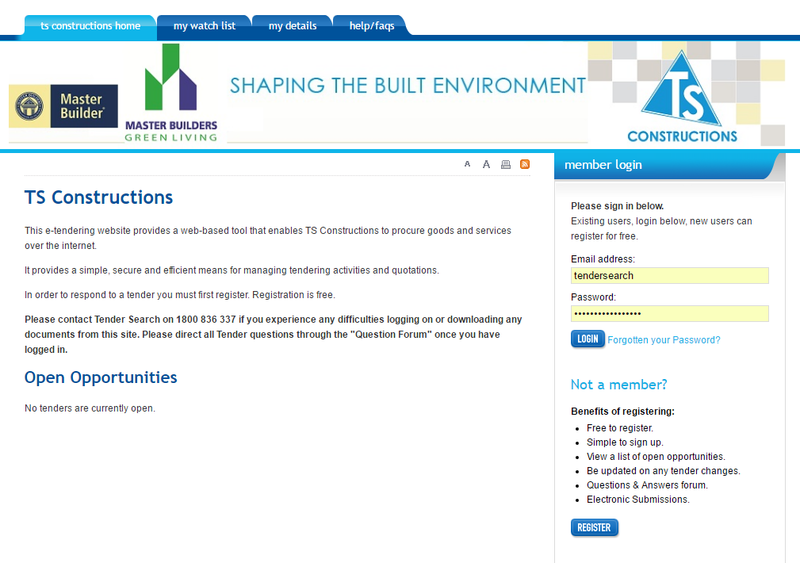 TS Constructions have been using TenderSearch for almost two years. It has proven to be a great management tool that has streamlined our systems and provided us with a higher level of control of our tender process. Our business requires us to subcontract out specialists trades and compile our own tender submission. Deadlines and accuracy are critical: which are two components that TenderSearch provides for us. We generally operate on a closed tender system, with an invitation sent to prequalified subcontractors. One of the biggest benefits has been the ability to see which subcontractors have downloaded documents and when, providing an insight as to the likely response to each component of our tender compilation. If it looks as if we may have an issue with a particular trade we can expand the number of subcontractors invited which ensures we meet our submission dates. 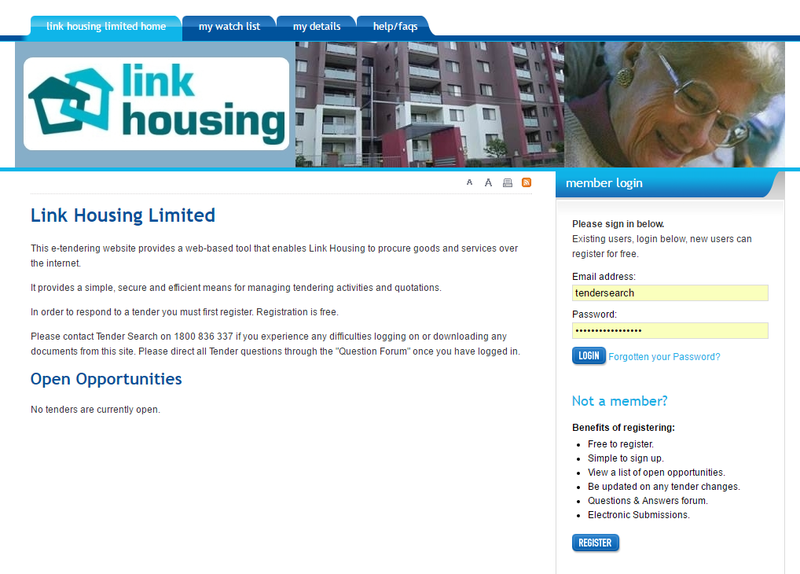 The TenderSearch system has also been hyperlinked to our website. Subcontractors who wish to work with us can easily and quickly register, providing us with an increased number of potential subcontractors to prequalify and select from. This has been particularly important for when we are tendering for work outside of our regular geographical reach. The system is simple to use which is particularly important for some of our subcontractors who are not necessarily ‘computer savvy’. Almost every subcontractor has picked up the concept quickly and have told us they appreciate the immediacy of it. Rather than waiting for hard copies of plans to be produced, or for slow internet connections to deliver multiple copies, they have access to all the relevant information instantly. This enables them to manage their time more effectively and ensures we get quotes in on time. TenderSearch have demonstrated their ability to adapt their programming. A feature of the last update is the ability to send out relevant documents to subcontractors by Trade classification, ensuring that our subcontractors only receive the relevant details to their trade. From our perspective it has saved considerable time and resources in preparing and issuing tenders. We also find the Q & A function assists in ensuring all tendering subcontractors are kept up to date with all aspects of the tender. The reporting function is important for our ISO 9001 certification as it provides a method of auditing our processes. We would have no hesitation in recommending TenderSearch to others. Electronic procurement, or E-Procurement as it is commonly referred to, is widely regarded as one of the most efficient tools available in managing procurement processes on the market today. Although a recent entrant into this market our eProcure Solution is fast gaining a reputation for being a much sought after alternative to current market offerings. 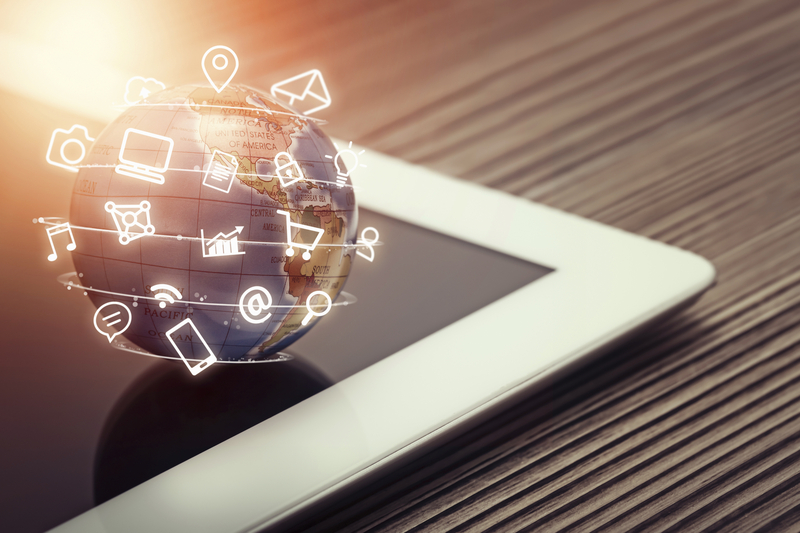 Some organisations have already made the move to procuring goods and services electronically whilst there are still many gearing up to make the move from traditional procurement procedures. Our Webinar is designed to highlight the huge benefits and ease of use for any business or organisation that regularly goes to the market to procure goods and services. With decades of experience in tendering and procurement, our staff will be there to answer questions about procurement and the benefits of our eProcure Solution. We would like to invite you to attend one of our short Webinar’s that will focus on solutions that will help you improve your efficiency, reporting and overall transparency of every procurement exercise you partake in. Please register your interest using the button below, its quick and easy. Powered byTenderSearch, Australia’s largest privately owned Tender solutions provider, with over thirty years’ experience in the space, eProcure offers a Web-based solution to the complex tasks involved in managing your procurement. Our eProcure portals provide a simple, secure and efficient means for managing procurement activities online. Incorporating the sending and receiving of approaches to market and quotations online, reducing the time and effort required for both buyer and providers.